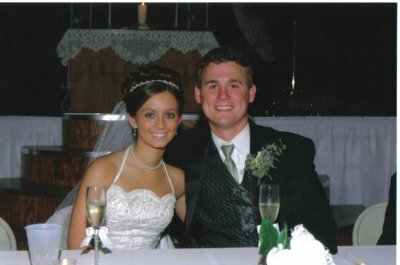 Meet your neighbors Nick and Shayla Troutman, who were married on May 19, 2007 and reside in Terre Haute. Nick moved to Denver, IL, right outside of Carthage when he was a third grader. He graduated from Carthage High School in 2002. Shayla has lived in Terre Haute her whole life. She attended La Harpe High School, graduating in 2004. She will graduate from Western Illinois University in 2008 with a major in graphic communications and a double minor in marketing and management. She just finished her internship at River Basin Publication in Burlington, IA and hopefully will be returning after graduation to work there. In his spare time Nick enjoys drawing and fixing up the house. Shayla likes to take care of her animals, work in the garden, and play the piano.